Lyonia mariana.Kenneth Lawless.Digital Atlas of the Virginia Flora.2014.Virginia Botanical Associates, (Accessed 5/2014).Blacksburg. www.vaplantatlas.org. 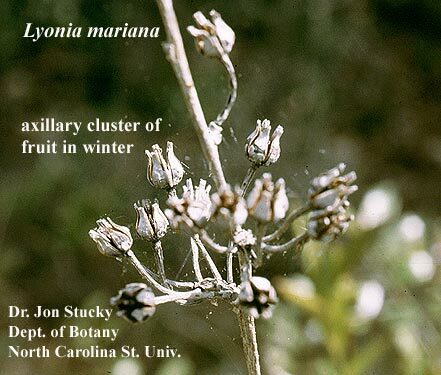 Lyonia mariana is a so 2 m, colonial from root sprouts or rhizomes, roots associated with highly specialized ascomycota ericoid mycorrhizae, (Allen1991); bark gray. Leaves alternate, elliptic, to 6 cm long, blunt, entire, hairy on veins below, leaf stalk to 0.4 cm. Flowers white, vase-shaped 1.3 cm long; inflorescence elongate with flowers in small clusters along ends of stems, stalks to 2 cm. Fruit dry, 0.6 cm, brown with pale longitudinal stripes along valve edges, urn-shaped, persistent into winter, winter buds elliptic, pinkish, about 0.2 cm long above pale triangular leaf scars ca 0.2 cm. 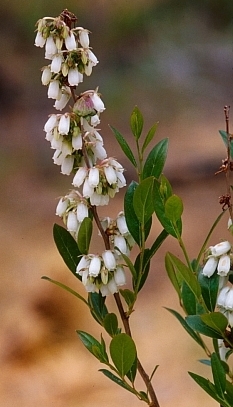 Lyonia mariana.Dr. John Stucky.harvestcals.ncsu.edu (Accessed 5/2014). Habitat: Understories of undisturbed upland oak forests and oak or serpentine barrens in dry, acidic soil.